27 songs from 1897-1925, 28-page booklet with historical notes, artist bios, and unusual graphics chronicling the rise of "hot" playing in American music over four decades. Rare tracks by banjo virtuosos Cullen and Collins, vocalist Silas Leachman, Jim Europe's Orchestra, and his proteges in the Versatile Four. The ultra-rare "Sunset Medley" by Haenschen and Schiffer is here released for the first time, along with Edison cylinders by Sophie Tucker and Polk Miller. Companion to the book by David Wondrich, published by Chicago Review Press on the A Cappella imprint. 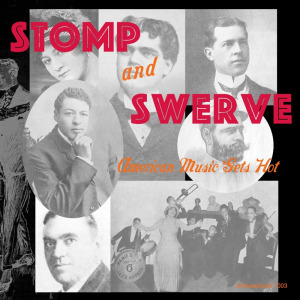 Visit Stomp and Swerve's expanded catalogue page to see the complete track listing, read an extended description, and listen to sound samples.